“It’s difficult to talk about HIV and AIDS in Darfur. You can’t really talk about it openly in the camps”, says Gloria Gwoka Nakoboji, the HIV/AIDS Project Officer for the Sudan Council of Churches – SCC (A Caritas partner) in Nyala, Darfur. Estimates of people infected with HIV vary greatly across Sudan and in Darfur many people would go as far as to question the existence of diseases in general let alone AIDS. There are deep seeded cultural perceptions of AIDS in the Internally Displaced People’s camps and the SCC continues its innovative work through community networks, campaigns and education in order to counter these perceptions and prevent the spread of the virus. This challenging context provides a variety of dilemmas for the confident and creative workers that have made the project such a success with communities in South Darfur. Gloria said, “Most of the people have very little education, and because of religion and culture, it is very sensitive to talk about HIV in a social setting. 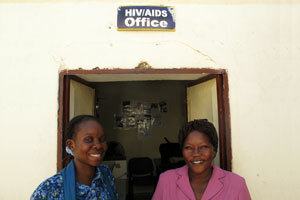 Gloria is an outspoken voice on HIV issues in Darfur. Her experience and confidence in her work is reinforced by the success of the programme and her ability to overcome community, cultural and religious perceptions of the disease. She has made great strides in promoting a culture of education and prevention in the camp communities of Darfur. On World AIDS day, December 2008, the SCC organised a street parade in the main street of Nyala Town which Gloria reflects on with enthusiasm. She said, “The event attracted thousands of people”. This massive community involvement is indicative of the changing perceptions regarding the disease. For the street to become a forum for a topic such as AIDS, is a marvel. The SCC continues to be innovative in the ways it engages with communities in Darfur on the effects of HIV/AIDS and communities are being equipped with practical skills which can be incorporated in their daily lives in the Internal Displacement Camps. In 2009 over 120,000 people were reached with HIV/AIDS messages and the SCC trained 652 community members to effectively deliver these messages and become outspoken voices in their communities. Gloria said, “We have two trainers in the programme and 24 community educators who are responsible for the project. These educators provide training for the students in secondary schools so they can learn how to halt the spread of the disease and deal with its effects”. These seminars for higher education are carried out in Mershing, Dereig and Bilel camps. “We have established innovative community based initiatives, such as community committees and peer educators that act as important channels for effective communication of AIDS messages. In Bilel Camp, the community centre is a meeting point where people can attend education classes and be trained in masonry, welding and tailoring. The SCC has worked hard to ensure this sense of community and collaboration forms the heart of the centre so it can be used as a forum for discussing and implementing HIV and AIDS awareness training. For the 30,000 refugees who have fled violence and sought sanctuary at Bilel, the community centre has become everything to everyone. The AIDS project has been so successful that the SCC will expand their activities to West Darfur in 2010, and will operate in the Garsilla area. They will also test 1,500 people who have been reached through their awareness and outreach activities. The SCC are looking to build on the inspirational work which has been achieved in 2009. Despite the immense steps that have been taken in raising awareness, community attitudes indicate there is still a long way to go. Through existing community structures such as community centres, clinics, water committees, women and youth groups, Gloria and her team will continue to serve her people and work to eradicate the silent killer which continues to claim lives amidst the violence and insecurity in Darfur. Gloria said, “With the training that NCA have provided, I’ve learnt a lot of different things that have never been available to me in Sudan. With this training, I have been able to plan for new prevention programmes and take these programmes to the communities”. Caritas Internationalis works in Darfur in cooperation with Action by Churches Together (ACT) helping 350,000 people, including 240,000 who have lost their homes. The implementing partner, Norwegian Church Aid, has two national Sudanese partners, the Sudan Council of Churches and Sudanaid (Caritas Sudan).